Cambodia effective from 1st March, 2018. He will take a leading role in the development of TOL ministry in Cambodia. 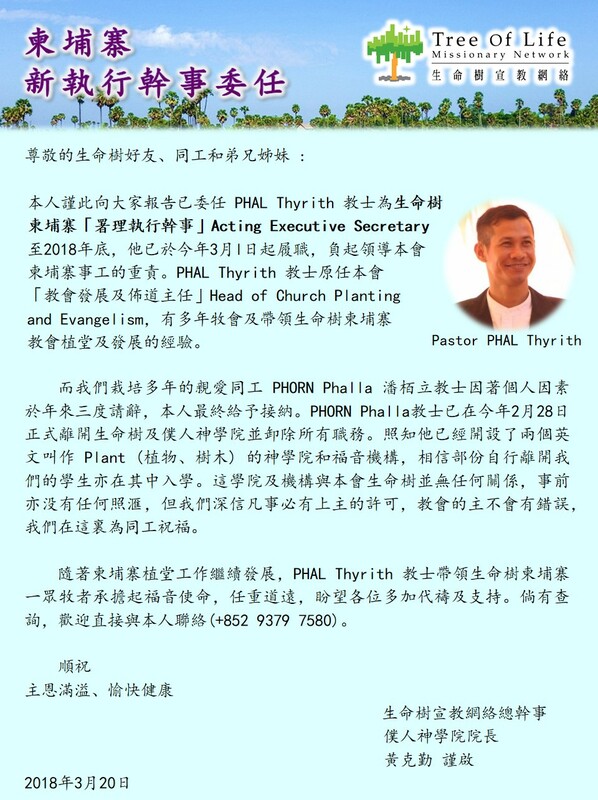 Pastor PHAL Thyrith is experienced in church planting during his original post of Head of Church Planting and Evangelism, Cambodia. On the other hand, I would also like to inform that I accepted Pastor PHORN Phalla’s resignation as he raised it for three times with his personal reason. Pastor Phalla has disengaged all duties in Tree Of Life, Cambodia and Doulos Seminary since 28th February, 2018. To our knowledge, he has established new ministry called Dam (Plant) which this does not have any relation with TOL. I would like to take this opportunity to wish him success in the future with the grace and blessings from our Lord. TOL will keep on the development of Cambodia ministry，please pray for Pastor PHAL Thyrith who will take the burden and be the leader of our pastors. Should you have any enquiry, please kindly contact me directly on +852 9379 7580.